Thanks for visiting our Anaheim, California security system portal. D&S Security has been setting the standard for home security systems in Orange County since the 1980s, and we take our reputation very seriously. After all, the work that we do stands between our clients and the criminal element. This city is a magical place to live, and people visit from all over the world to enjoy attractions like Disneyland, Knott’s Berry Farm, and baseball games at Angel Stadium. We have assisted many local clients over the years, and we look forward to making new friends as time goes on. From the South Knott Avenue/Lincoln Avenue section to Peralta Hills, for burglar alarms in Anaheim, CA, you can’t go wrong with D&S Security. In addition to the home security systems that we offer, we specialize in security systems for businesses. We can install intrusion alarms, and we having a great deal of expertise when it comes to video surveillance systems. An investment in a security camera system for your Anaheim, California business will pay for itself over time when you take theft detection and prevention into account. The ability to record everything that is going on can also be quite valuable if you are ever accused of negligence after someone is injured on your property. A CCTV system can enable you to monitor employee production as well. Access control for Anaheim, California commercial structures is another area of specialization for our company. 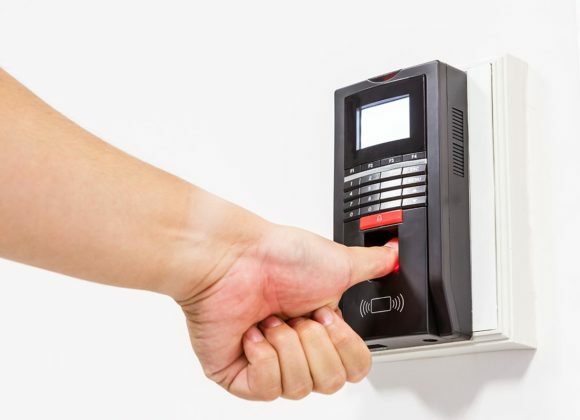 We offer proximity card readers, and these are quite popular because the cards are very inexpensive to reproduce, and you can run reports to track the comings and goings of your employees. Biometric systems that are triggered through physical characteristics like fingerprints are available, and we can install numeric keypads if this is your preference. Access control can be limited to the points of entry, but you can also engage us to put a parking lot system in place. No commercial security strategy is complete without a highly sensitive, state-of-the-art fire alarm system. We can gain an understanding of your needs and explain your options so you can make the right choice. Plus, our company will monitor the system around-the-clock at our UL monitoring station, so we provide a turnkey solution. If you are ready to protect your home or business, you can reach one of our Anaheim, California security system specialists right now at 800-521-1958. You can alternatively click this link if you would prefer to get in touch electronically.